On an upcoming cruise in the Mediterranean we will be exploring a couple of ports that are new to us in Spain. How will we explore them? Ship's excursion or on our own? Time to do a little research. 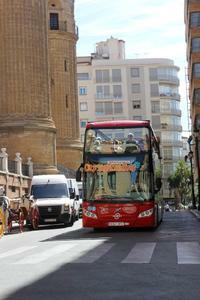 Our favorite way to get around in Barcelona which is also one of our ports on this cruise is by the Hop On Hop Off bus. The Barcelona operation has three lines of travel around the city and is easy to pick up from most any where. A running commentary is available on each bus with the ear buds provided. Just plug in and choose your language. It turns out that there are lots of Hop On Hop Off buses available in many cities throughout the world as this popular way of getting a taste of the location in an easy and leisurely (or not so if you are short on time) way. Check out the main HOHO page for a listing of all the places they serve. From the list you can click and get an overview of the city you expect to visit. Malaga, Spain, is a port of call we've not done before and lucky for us, they also have a HOHO bus. While we've been to Cadiz before, we didn't get much opportunity to explore. As I recall I wasn't feeling well on that day so the HOHO bus will be a good way for us to see more of the city. The prices are always reasonable especially when compared to the cost of a ship's excursion but you do have to be careful of your time and make sure you get back to the ship before it's scheduled to pull out of port. They won't wait for you if you are not on a ship excursion. It's Summer! Here We Go! Do All Cruise Extras Come At A Price? Travel Experiences - How Do You Meet The Locals? How Well Do Your Table Manners Travel?